In sports, as in life, one of the most important things to have is momentum. 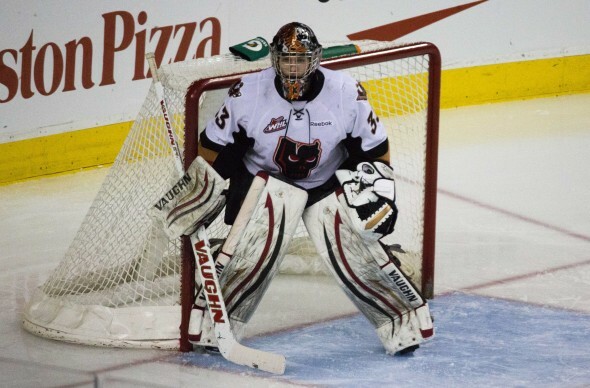 Just ask Calgary Hitmen goaltender Chris Driedger. Ranked as the number 12 North American goaltender by NHL Central Scouting, Driedger emerged onto the scene as part of a goaltending tandem in Calgary with Brandon Glover. The Hitmen have rotated between the netminders all season, allowing both the team and the individual goaltenders to ride the waves of momentum. The approach has allowed Driedger to greatly improve his stock after a 2010-11 season in Tri-City which saw him stuck behind Drew Owsley on the depth chart. He only played 22 games that season and posted a 6-6-1 record. This season, he’s posted a 23-12-3 record, dramatically improving his goals against from 3.50 to 2.87 and helping the Hitmen rebound from a disappointing 2010-11 season. Having another draft-eligible goaltender in Glover there to push Driedger has definitely helped both men improve and given the Hitmen some strength in net to build upon throughout the season. Driedger isn’t quite an elite goaltender yet. He’s sometimes prone to letting a game’s momentum overtake him – case in point, a 9-5 loss to the Edmonton Oil Kings in February that saw him give up seven goals – but that’s the kind of thing that a goaltender can eventually overcome with time and effort. And while he’s yet to play in a playoff game in the WHL, he’s shown he’s able to elevate his play in critical situations; he stopped all 14 shots he faced in the CHL Top Prospects Game, which he only got the chance to play in due to an injury to Malcolm Subban. Life’s all about momentum. And if Chris Driedger can maintain the momentum he gained from his strong play during the WHL’s post-season, he may find his draft stock elevated as well. No significant experience, but did participate in Hockey Canada’s Program of Excellence Goaltending Camp in June 2011. He was the only WHL netminder to be named to the U-18 camp. He’s considered a strong contender to represent Canada in a future World Junior event. He also previously represented Team West at 2011 World Under-17 Hockey Challenge. The team finished sixth. Lower-tier NHL starter or consistent back-up. Originally drafted by the Tri-City Americans in the fourth round of the 2009 WHL Bantam Draft. Ranked 13th among North American goaltenders by NHL Central Scouting.